Welcome to Moore Truck Sales, family owned and operated, in business since 1988. 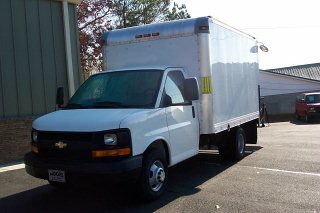 Please browse this site to check out the current inventory of work trucks, including service / utility body, stakebed / flatbed, dump trucks, passenger, cargo vans, box vans/trucks, and buses. If I don't have what you need in my stock, I will be glad to find it for you. I value the opportunity to earn your business. Contact me, Steve Moore, owner, directly at 1-866-231-9895. Conveniently located in Carrollton, GA. (50 miles west of Atlanta, GA and 100 miles East of Birmingham, AL) Easiest directions - on Interstate 20, take Exit #11 - U.S. Hwy.27 - go south 7 miles and my lot is on the left side of the road. Closed Saturday & Sunday. Delivery is available for any vehicle for an additional fee.